SSC Describe type Exam Study Materials pdf download available here. 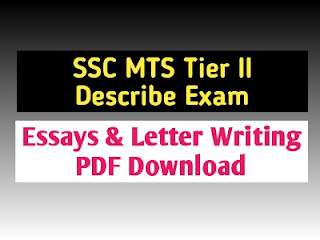 Essay & Letter writing is the Most Important topic for SSC MTS Describe type Tier II Examination. So candidates are more practice and improve their Writing Skill. SSC Tier 2 Examination is close to the door. Today GK Solve Share some Important Study Materials pdf download link for SSC Describe type Examination. This is Most important study materials for you. You can download this pdf easily from our site. In this pdf, you can get important Essays and letter writing. Also, you can know how to write the formal & Informal letter? So candidates are requested to Download this pdf as soon as possible and make your practice better.